Dry freight & refrigeration locks & keepers. 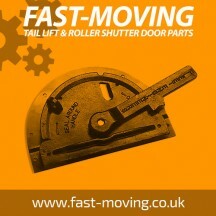 There are many manufacturers of dry freight locks & keepers and we at FAST-MOVING.co.uk can help you with advice on wether a product will interchange on their dry freight roll up door product or not. In most circumstances we will have a solution for you that is cost effective whilst maintaining high standards. All dry freight locks & keepers supplied are manufactured by Fleet Engineers in USA and are are the very highest standards in quality at an affordable price. This gives you peace of mind that when you lock your dry freight roll up door it stays locked. Fleet Engineer replacement parts are suitable as some replacement components of many door types including :- Dry freight, Coldsaver, JR Industries, Whiting doors, Mobile doors, Henderson doors, Todco doors, Boyriven FIT doors. Dry freight roll up door type 77 lock. These locks are used on all dry freight over..
Dry freight roll up door maxi lock/access lock. These locks are used on all dry freight ..
Dry freight roll up door type 77 lock keeper. These keepers are used in conjunction..
Dry freight roll up door maxi lock keeper. These keepers are used in conjunction with dry fre..